If you’ve been following Dell for the past year, you know we’ve been talking a lot about being more flexible and responsive to customers. We’ve been making moves to allow us to respond to trends in the market and help us stay on the cutting edge. Continuing to empower customers with IT solutions that give them the power to do more. With that in mind, we’re very happy to announce that soon we will be offering MakerBot Replicator 3D printers and scanners as a continuation of our end-to-end 3D design solution for small and medium-sized businesses in the U.S. By adding MakerBot 3D printers and scanners to our existing portfolio of Dell Precision workstations, our engineering customers can design and test new product concepts quickly; architects can create 3D prototypes during the design phase; and start-ups can experiment with new product designs and artistic models inexpensively. The last few years have been an exciting time for what is referred to as additive manufacturing, especially in the desktop space. 3D printing has moved beyond early adopters and hobbyists, and is now being utilized in business applications where cost and time-to-market benefits are gained, with IDC predicting that the 3D printer market will see a compound annual revenue growth rate of 29 percent from 2012 to 2017. Just last week, Credit Suisse revised their projection for 3D printing in 2016 up 357 percent! Small businesses are finding that desktop 3D printing provides a cost-effective alternative to enlisting off-site or overseas prototyping facilities to create molds and designs, allowing designers and engineers to design, build and innovate more often, more affordably and at a faster rate. To help get to that exciting endpoint, MakerBot printers and scanners are being added to an expansive portfolio of products designed for advanced 3D and design projects including Dell Precision Workstations featuring advanced graphics solutions, Dell Ultrasharp Monitors (including our new 4k solutions), and other products such as Wacom digitizers and 3Dconnexion controllers. 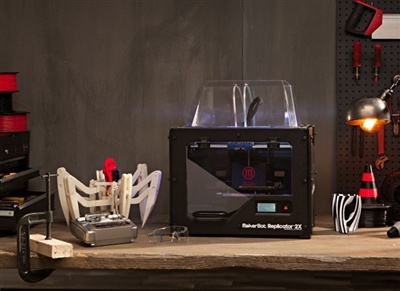 If you’re in the area, Dell will be showcasing 3D design solutions, including Precision workstations and the MakerBot Replicator 2 Desktop 3D Printer, in booth 501 at SolidWorks World from January 26-29 in San Diego, CA. MakerBot products including printers, scanners, and filament will be available for purchase from Dell via www.dell.com/3Dprinting on Feb. 20 in the U.S. Availability in other countries will be added in the future.